Francesann Agnes Lawrence, age 82, passed away on January 7, 2018 at her home of 47 years in Belmont, California, surrounded by her daughters and loving family members. Fran was born on January 27, 1935 to her parents Dorothy and Antone Duarte in San Francisco, California, and was the oldest sister to four brothers and one sister. She married Clifford Joseph Lawrence on November 29, 1955 in Pescadero, California, and had two daughters, Maggie and Katie Lawrence. She is preceded in death by her husband Cliff, and brothers Cliff, Bill, and Jimmy Duarte. 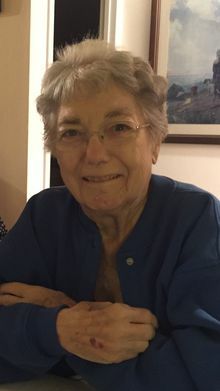 Fran was a devout Catholic who enjoyed traveling, sewing, baking, reading, daily crossword puzzles, Jeopardy, and golfing weekly with the Meadowlarks Ladies Golf Club and Mariners Point Women's Golf Club. Later in life she spent her days working for H & R Block and the non-profit organization Fear of Flying. She is survived by her daughters Maggie Paalua, Katie McCrosky and husband George, her three granddaughters and their husbands, Kristina and Mathew Norberg, Jennifer and Joshua Austring, Kerri McCrosky and Sean Page; her four great-grandsons Cameron, Levi, Tyler, and Wyatt; her brother Rocky Duarte and wife Yvonne, her sister May Doll and husband Doug, as well as nephews and nieces and their children and grandchildren. A Funeral Mass will be celebrated at 11:00 am Thursday, January 11, 2018 at St. Anthony's Catholic Church, 696 North Street, Pescadero, California, with a reception following at the Pescadero Native Sons Community Hall at 112 Stage St., Pescadero. In lieu of flowers, please consider a donation to the American Cancer Society, 1650 S. Amphlett Blvd. #110, San Mateo CA 94402. Online guestbook available at millerdutra.com. It's so hard to believe that Fran has gone on to be with God. I will miss her dearly! May God grant her family with all that they need to get through this time of bereavement. I worked with Fran at Block Advisors for 18+ years, she is/was such a doll and is/was such a hoot! Her energy and loveliness will stay with me forever. Let's not forget her yummy muffins she would bring to the office every Sunday during tax season and along with her beautiful smile she is someone I will never forget. Everyone at our office was so sad to hear the news of her passing but I know she will be happy in heaven with her beloved husband and her other family members who loved her so much. Please be happy in heaven lovely Fran. Fran was my mother's best friend. They did so much together. In their younger years they were there for their children. I was the oldest in my mother's family. Fran was there for every major event in my life. She made my prom dress. She made a cake for every event that we asked her to. Her and Pete were always there for us. She had a heart bigger than anyone I have ever known. I will miss her forever, I ho[e that whe nues she goes to heaven that her, my mom, dad, and Pete will be there to watch over us. She is an amazing woman, and I will never forget her. Maggie and Katie, you had the most wonderful mother in the world, I hope you know that..... I know you do. We have lost one the the TRUE treasures of this world. Fran is one of my classmates from Mercy High School, Burlingame. We graduated in 1952. Thank you to the famiIy for her lovely obituary in the 01/09 SF Chronicle. Fran partnered with me in 2012 to present a Reunion experience for our Class of '52 in conjunction with the annual Reunion of all classes at the Kohl Mansion. I remember Fran as a friendly, soft-spoken woman with a gentle sense of humor. High school classmates, as we know, scatter to the winds but are never forgotten. I hope that Fran's last days were as pain free as possible and am certain the love of her family eased her transition. I send my heartfelt condolences to Fran's family. Even though Fran lived a full and happy life, we are never ready to release our loved ones. My wish for you all is peace and gratitude that she was so central to your lives.